I’m generally a big fan of “survival stories.” I, for whatever reason, enjoy watching characters rely on their wits and skill to survive. “The Grey” and “Gravity” being recent examples that pop to mind. 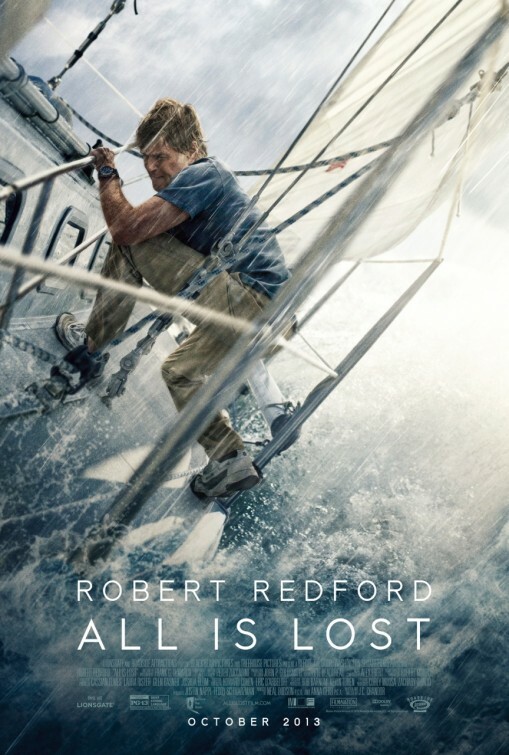 J. C. Chandor’s “All Is Lost” is the most recent addition to this sub-genre. With Robert Redford as the sole human face in the film. His character is listed only as “Our Man” in the credits. The plot is pretty direct, our man, on what one gets the sense is an around-the-world voyage in his 39-foot sailing yacht (called “The Virginia Jean”), strikes a shipping container filled with children’s sneakers in the Indian Ocean. 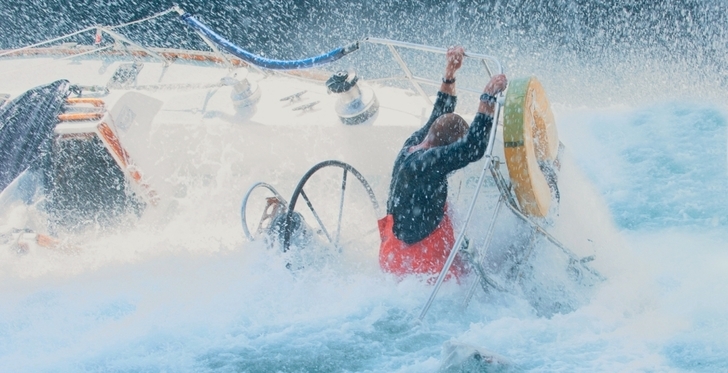 The impact rips a gash in the side of his boat, and water begins pouring in. Chandor (whose last film, “Margin Call” was his award-winning debut) has placed this film firmly in the point of view of our man. We know and see nothing other than what he does. The film opens with our man awaking on the initial impact, and fades to black whenever he sleeps or passes out. The effort is clearly to place us in this man’s shoes. This achieves the desired effect, that begins to bond us to Redford’s character. We are enduring these events with him, we are struggling to survive with him. What was rather surprising to me was that the film did not seem interested in grabbing me in a deeply emotional sense, as other films of this ilk have. I had a deeply visceral, emotional reaction to the final minutes of “The Grey,” for example. “All Is Lost” seems far more interested in process than emotion. I want to expressly state that I don’t write that as a criticism, simply as an observation. 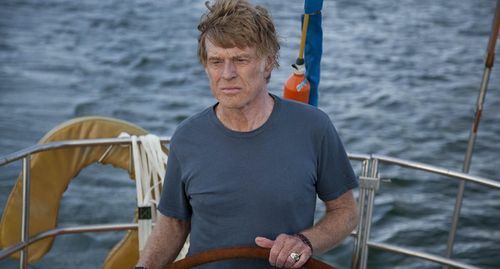 Redford’s character is, it appears by design, unknowable, and the glimpses of his life away from this boat are brief and non-specific. There’s an interesting push-and-pull in the film, filmmaking is structured to bond you to our man, but the script keeps him at arm’s length. The overall effect is to heighten the everyman experience. The character has many trappings of the wealthy, but the lack of information doesn’t allow us to write him off in that manner. Perhaps, with Redford being 77, this is a man who saved and planned for this trip his entire life, only to be subjected to every manner of disaster that could befall a sailor deep in international waters. Likewise, what little information we get about his family could support any number of backstories. Maybe I’m reading too much into it, but I feel like this choice is strong, in terms of divesting the character of baggage that might impede an audience relating to him. As I said, the ultimate feel is one of process. We watch Redford’s character struggle against fate and the elements, and see the process of repairing a hole in the boat’s hull, or changing out a storm jib. It’s vastly compelling, but on an intellectual level, rather than emotional. Although, even that changes, as I reconsider the film. Our man slowly loses his faith in his abilities. Redford’s carefully modulated performance shifts from one of pure confidence to one of desperation. All with virtually no dialogue. There’s been some comparison to Tom Hanks in “Cast Away,” but that film developed the trope of Wilson the volleyball to keep Hanks talking. Redford is left to his face, eyes and actions to spell out his internal life. Redford’s performance is quite wonderful, even if it plays to the image we have cultivated of him over his career. He’s a do-er, he handles situations, and does so without much fuss. Then, as time and the elements wear on him, that movie-star cool we’ve come to expect begins to wear away. I don’t really want to delve too much into the resolution of the film, suffice to say I thought it was appropriate. I didn’t feel slighted, cheated, or pandered to. It is an ending that will probably spark debate, but that is, I believe one of the film’s strengths. 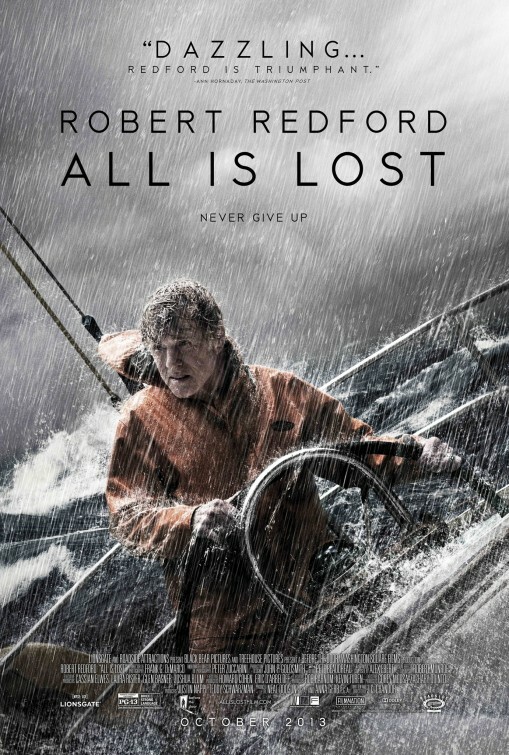 I don’t feel like “All Is Lost” is probably destined for mass acceptance. It’s a meditative film, for the most part, about the process of trying to survive in a disastrous situation, and watching a person of strength and willpower slowly succumb to the inevitable. I found it gripping, without reaching a level of “powerful.” That level, for me, personally, comes from a deep emotional connection. I loved the film, but it’s not going to haunt me, as I found “The Grey” does. That said, it’s a superior piece of filmmaking with a tremendous lead performance. Well worth seeing.